The first purpose of this study was to compare the clinical and radiographic outcome of two different locking plates used for valgus-producing medial open-wedge high tibial osteotomy (HTO). The second purpose was to histologically evaluate peek–carbon wear for biocompatibility. Twenty-six consecutive patients undergoing open-wedge HTO using the first-generation PEEKPower HTO-Plate® (Group I) were matched with 26 patients after open-wedge HTO with the TomoFix™ plate (Group II). Clinical scores (visual analogue scale for pain, WOMAC, Lysholm score) were obtained preoperatively and at a minimum follow-up of 24 months postoperatively. Fixation stability was evaluated radiographically by comparing the medial proximal tibial angle (MPTA) and tibial slope 2 days after open-wedge HTO and after implant removal. Tissue samples of Group I were collected at the time of implant removal for histologic evaluation. Implant-related complications occurred in 15 % (n = 4) of Group I and 0 % of Group II. Out of them, 3 implant replacements were excluded from statistical analyses. After a final median follow-up of 25 months (range 24–31), the clinical scores in both groups showed significant improvements compared to preoperatively (visual analogue scale, WOMAC, Lysholm score; p < 0.001), without significant group differences (visual analogue scale, n.s. ; WOMAC, n.s. ; Lysholm score, n.s.). 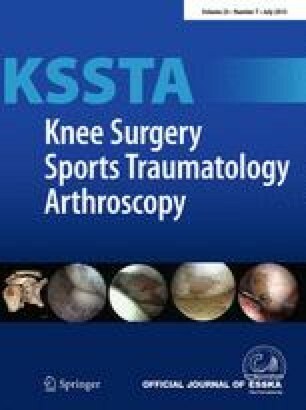 No significant differences between baseline and follow-up measurements for MPTA and tibial slope were observed within each group (MPTA: Gr. I, n.s. ; Gr. II, n.s. ; tibial slope: Gr. I, n.s. ; Gr. II, n.s.) or between the two groups (MPTA, n.s. ; tibial slope, n.s.). In histologic samples, CF PEEK abrasion did not induce inflammation or tissue necrosis. The first-generation PEEKPower HTO-Plate® provided a higher rate of implant-related complications compared to the TomoFix™ plate at a minimum follow-up of 24 months after valgus-producing open-wedge HTO. Therefore, it is not recommended to use the first-generation PEEKPower HTO-Plate® in the clinical practice. Matthias Cotic and Stephan Vogt have contributed equally to this work. A.B. Imhoff and Stefan Hinterwimmer are consultants for Arthrex. The company had no influence on study design, data collection, and interpretation of the results or the final manuscript.